So Lord, won’t you buy me a Wonder Woman bag? I covet this bag by Diane Von Furstenberg. I love superheroes (or heroines). Or really frickin’ cool. I don’t have a bag of any kind unless you count my tiny little Hell-Mart crocheted number. Or my backpack. The one above makes me want to run out into my backyard and spin in circles while wearing my Wonder Woman Underoos. Hey I love Wonder Woman for her rather large…..eyes! A bit off topic- I recently read an article about people deciding in real life to be super heros, without superpowers but giveing themselves super hero names and doing super hero like things. I thought that was quite fun. Oops…. I posted too soon- I was going to say Selma- you could be Dust Woman- and go around cleaning up all of the dust. You could get a cape. And a little dustbuster machine. OMG!!!!!!!!!!!!!!!!!!!!!!!!!!!!!! Where do I get me one????????????? I loved the tv movie starring the blonde Cathy Lee Crosby as WW. Linda Carter played her a little too….safe…..a little too sweet and passive. I always thought it interesting that WW’s secret power was her invisibility. Hmmmm a man did write that, didn’t he? Where have you been? That is such a great song and your extra verse is perfect. I could definitely spin in circles while wearing Wonder Woman undies. She is so cool. And wondrous! I love many, many superheroes. Wonder Woman will always have a special place in my heart! I hadn’t heard about that but what a fantastic idea. I wonder if they stopped any criminal masterminds??? You can buy it online from various places. 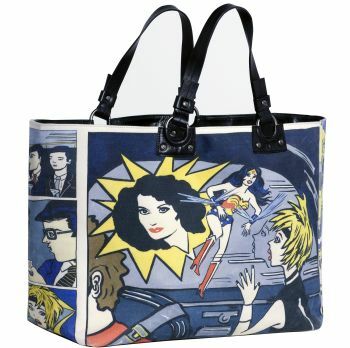 Just type in ‘Wonder Woman Tote’ to Google and away you go….. I haven’t seen the movie. I’ll try to find it on DVD. Yes, I always wondered about the invisibility thing too! Wonder Woman is so gorgeous. And tough. No one messes with her. My kind of superhero! I do like the old Janis Joplin song. The bag isn’t quite a Mercedes Benz but it’s on my wish list nonetheless! Isn’t it? If you had one it would certainly be a talking point wherever you went! awesome! my wife has a bag in the shape of an old maxell cassette tape, and i envy her ability to carry it! I get canvas shopping bags (free!!) from all sorts of places. But, a lady I know had a superb one in an Art Deco design (based on a 1920s Cunard ad) that she’d bought at a gallery. But, as for Wonder Woman … I liked the actress who played her (what was her name again?) better! Hi Selma—WONDER WOMAN!! How very fun. “Target” carried some sweet totes(made of canvas) about a year -and-a-half-ago. I got one for dear friend and poet, Collin Kelley, who has a great poem about Wonder Woman! btw, I apologize for being so “absent” the past few months…I’m endeavoring to get “caught up”, by reading your posts in chronological order. I’ve been way too obsessed with Facebook. You may Friend-Request me there, under “Lisa Nanette Allender”. Peace to you, Selma. The only problem with the bag is that Wonder Woman resembles Diane herself. What a fantastic bag. A Maxell cassette tape. I still have a few of those old tapes. I play them occasionally on my old tape recorder. They are songs I recorded off the radio in the 70s and 80s. I keep them for old times sake. The bad thing was I usually missed the opening bars in the time it took me to press ‘play and record’ so I have all these songs without beginnings! Linda Carter was hot. I love those bags with the Art Deco prints. One of my fave periods! No need to apologise. I haven’t been as regular with my posting as I’d like, either. Sadly, I don’t have the time to be on Facebook, but I’m glad you’re enjoying it! When I was growing up, it seemed like every heroine had blond hair. The vamp/villainess always had dark hair. (Think I Dream of Jeannie, remember her evil cousin?!) Anyway, Wonder Woman had dark hair like me. She kept me from going over to the dark side. Even though I am blonde I always wanted to be a brunette like Wonder Woman. I thought she was so gorgeous and gutsy. I put a dark rinse through my hair when I was 14 and my Mum nearly had a fit. She grew up in the era where blonde really was considered to be beautiful and couldn’t understand why anyone wouldn’t be happy with naturally blonde locks. I am truly glad times have changed!